I received a notice about my 30th high school reunion back in May. It took place the weekend of July 8th. I didn't go. I went to the reunion Web page and looked at photos of some of the 67 out of 491 people that attended and I reaffirmed why I didn't attend. I barely recognized anyone. I almost got queasy imagining what it would have been like being there and milling about while people who didn't recognize me while I was in high school tried to figure out who the hell I was 30 years later. The most disconcerting thing about looking at the photos of the reunion was trying to equate the faces of these 48 year old middle aged people with their 18 year old former selves. On the reunion page, I also discovered a photo someone had sent in from 1973 (my freshman year). The photo was of the finals of a Junior Varsity Quiz match between my Junior High (East) and our rivals, North Junior High. 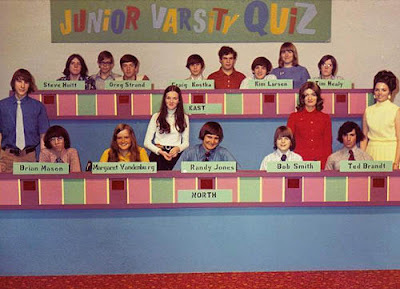 Junior Varsity Quiz was one of those local television programs where junior high school students competed answering Jeopardy type questions about a variety of academic subjects. I remember the match. We'd studied for months for the competition, spending our lunch hours in a classroom quizing each other using a Jeopardy Play at Home game. The rest of my team froze under the television lights, but I worked the buzzer like a pro. I was in the zone and whipped out five correct answers. It wasn't enough. We lost and went down in Junior Varsity Quiz flames, forever to be forgotten. I didn't even know this photo existed until it surfaced on the reunion page, submitted by a member of the other team. Maybe if we'd won that match, my life would have been different. Maybe I'd have gone on to Varsity Quiz and maybe prime time. I could have got an agent and branched out into movies or at least a sit com. I could have been somebody and maybe have attended my 30th high school reunion. I could have been a contender. Instead, I'm a punk. I'm a wornout palooka with a blog. A freshman? In 1973? My Bob, man, you were just a kid! I was headed to Navy bootcamp, in my quest to voyage to the bottom of the sea, avoid 'nam, get a paycheck, and avoid the shame of never having been on a quiz show. But rest assured, Tim, in another dimension, as suggested by string theory, you won that competition, became world famous, won the nobel prize, and are to damn snooty to have anything to do with the likes of us bloggers. I prefer this version, to tell the truth. THE Michael, In 1973, I was 15 and praying the Vietnam war would end before I turned 18. Regardless of that alternate reality I would never forget my roots and become snooty. 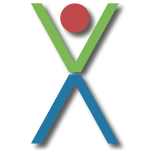 Besides, I'm beginning think it is the blog world that won't have anything to do with the likes of me. Hah! There you are in the back. Great picture! You look such a geek. Wow Yummy! Great story. You'll have to go back for your 40th and beat up those who froze during the competition for ruining your chance to bang Angelina Jolie. I have nice teeth, too! Well... I think you turned out wonderful!! I love the picture!!! Thanks Gina, I'm still pretty good at Trivial Pursuit.